It may only be early winter, but it’s never too soon to start thinking about spring. 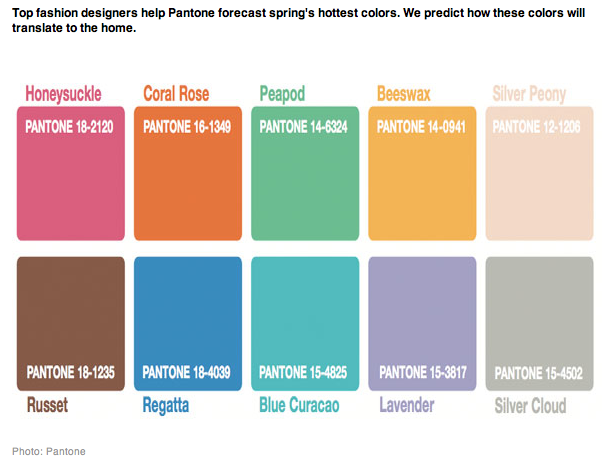 If you’re among the trendsetters who like to keep things “au courant” in your interior, take a look at the spring fashion color report, courtesy of the expert forecasters at Pantone. Each season, Pantone surveys the designers of New York Fashion Week to identify the most directional colors to guide the season. Take a look at these hue choices — and what inspired them — then pick a hue or two and start thinking of ways that you, too, can get inspired and revamp your style for the coming seasons. Woah I love those colours!